When a hormone-filled teenaged boy beams aboard the Enterprise, strange things start happening. What kind of strange things, you ask? 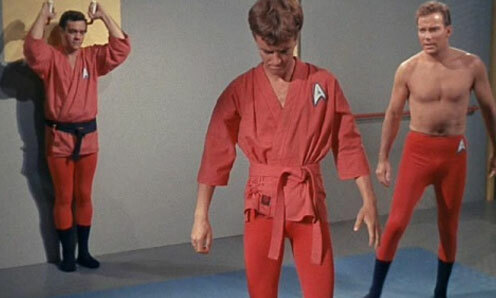 How about Kirk strutting around in skin tight red gym pants with coordinating black socks. Or Uhura gagging while Spock plays a mute space harp. Or a young crew-women turning into a lizard. Or Yoeman Rand donning a pink lingerie smock. Strange enough for you yet? This episode’s thesis is clear: pubescent testosterone and absolute power don’t mix very well. Kinda like Captain Kirk’s red pants and black socks. Would you like to peruse the Enterprise’s entertainment tape library? Do you know how to do a Kirk roll? Have you ever wanted to turn someone into a newt? Let us know your thoughts in the comments or send us an email at StarTrekQuest@gmail.com.